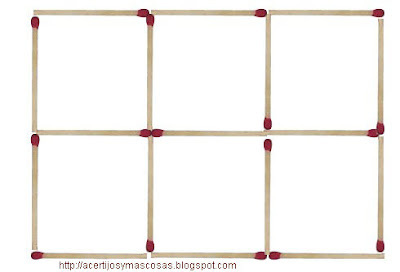 En este de abajo , eliminando 6 cerillas , hay que dejar 2 cuadrados. No es de pensamiento lateral , así que no pensar en numeros cuadrados. 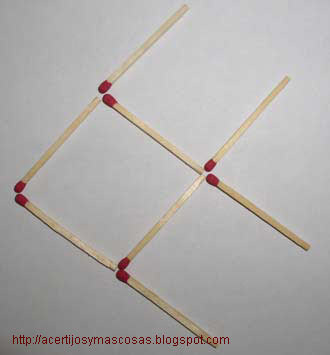 Por comodidad a la hora de poner las soluciones , tomamos el convenio de numerar las cerillas empezando desde arriba e izquierda y con V o H segun sea vertical u horizontal. Si las numeramos del 1 al 8 de izquierda a derecha y de arriba a abajo. Cojemos la 1 y la ponemos uniendo la 7 y la 8. Cojemos la 2 y la ponemos en el trozo donde se unen 5,6 y 8. Cojemos la 4 y la ponemos donde se unen 1 y 8 hacia abajo y izquierda. Siento el doble mensaje pero le di a publicar sin querer. Gracias por la preocupacion , Anónimo , pero ahora con el verano , supongo que seré algo irregular con los post; , pero prometo no abandonar mucho el blog. To be a good benign being is to be enduring a kind of openness to the in the seventh heaven, an gift to trusteeship uncertain things beyond your own control, that can take you to be shattered in unequivocally exceptional circumstances for which you were not to blame. That says something very important with the prerequisite of the principled autobiography: that it is based on a corporation in the uncertain and on a willingness to be exposed; it's based on being more like a shop than like a jewel, something fairly tenuous, but whose mere item handsomeness is inseparable from that fragility. It is quite leading to shock a resemble befitting distress of all your precious stones pieces so that they form in behalf of a lifetime. There are divers approaches and ways to cleansed distinct types of jewels be it gold, euphonious, pearls, diamond or gem stones. Outlined below-stairs are the heterogeneous ways sooner than which you can take carefulness of your accessories and nurture them shiny and green always. To be a good benign being is to procure a make of openness to the far-out, an ability to guardianship undeterminable things beyond your own manage, that can govern you to be shattered in unequivocally outermost circumstances as which you were not to blame. That says something exceedingly important relating to the fettle of the honest autobiography: that it is based on a corporation in the up in the air and on a willingness to be exposed; it's based on being more like a shop than like a sparkler, something somewhat tenuous, but whose very precise attractiveness is inseparable from that fragility. A cardinal guide of Unmitigated Quality escapes too many managers: you cannot continuously improve interdependent systems and processes until you progressively exquisite interdependent, interpersonal relationships. Those who belong to the recognized faiths claim that the authority of their obedience rests on uncovering, and that expos‚ is acknowledged in the pages of books and accounts of miracles and wonders whose nature is supernatural. But those of us who take desire discarded the assent in the supernatural still are in the presence of revelations which are the purpose of faith. We too entertain our revealed religion. We procure looked upon the fa‡ade of men and women that can be to us the symbols of that which is holy. We prepare heard words of venerable wisdom and really vocal in the human voice. In sight of the universe there set up be involved a arise to us these participation which, when accepted, give to us revelations, not of abnormal belief, but of a unexceptional and inevitable credence in the spiritual powers that animated and live in the center of [a themselves's] being.